Military-themed models, kits, artwork, apparel, accessories, and so much more! 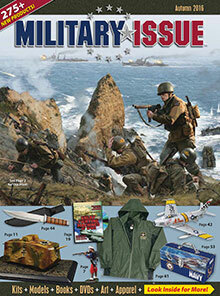 Pay tribute to the courageous and selfless armed forces by checking out Military Issue catalog, featuring a comprehensive selection of thousands of exciting collectibles that commemorate hundreds of years of world-changing events. Models, Kits, and Figures - Whether you want to collect a single model or re-create an entire battle, this catalog has everything you need, including miniature figures, unique scenery, and detailed replicas of aircraft, tanks, naval vessels and more. They feature scales from 1/16 to 1/1000 - with all sizes in between - representing heroic militaries from around the globe. Their premium models come from industry-leading brands such as Hobby Master, Falcon, Luft-X, EagleMoss, Wings of the Great War, and Warmaster, each one an immediate showcase centerpiece. Signs and Artwork - Spend hours exploring the classic artifacts, historic reproductions, unique home d�cor and most excitingly, a seemingly endless assortment of artistic renditions of iconic military scenes, within this Military Issue catalog. In addition to the limited edition, hand-signed prints - by legendary artists like Stan Stokes - you will enjoy metal and wooden signs featuring nostalgic designs created by heroes and civilians of previous generations. There's something for everybody in this exciting collection! Books, DVDs, and Games - The go-to catalog for the serious war buff or the casual fan of military history, their impressive library of comprehensive facts and little-known insight features thousands of books and DVDs on every subject imaginable. Load your bookshelf with great volumes like The War of 1812, A Chronology of World War II, or The Illustrated Encyclopedia of Weaponry. And don't forget to check out the fun-filled military-themed games, like the Pearl Harbor chess set of the Tactical Girls playing cards. Clothing and Accessories - As if models, d�cor, and books aren't enough, military enthusiasts will marvel at the selection of Military Issue catalog's rugged and stylish clothing and accessories such as their "T-Shirts With Attitude" collection - including "Whiskey Tango Foxtrot" and "BOHICA" - veteran sweatshirts and jackets, and handsome military watches. They also feature parachute pants, camo swim trunks, and flight coveralls, in addition to messenger bags, classic scabbards, and non-firing reproductions of recognizable firearms. Shopping for the military enthusiast in your life couldn't be easier! Now you can choose from thousands of items while also going easy on your wallet with the hot coupon code savings! Spend hours indulging your love of aviation with this fun, comprehensive catalog.